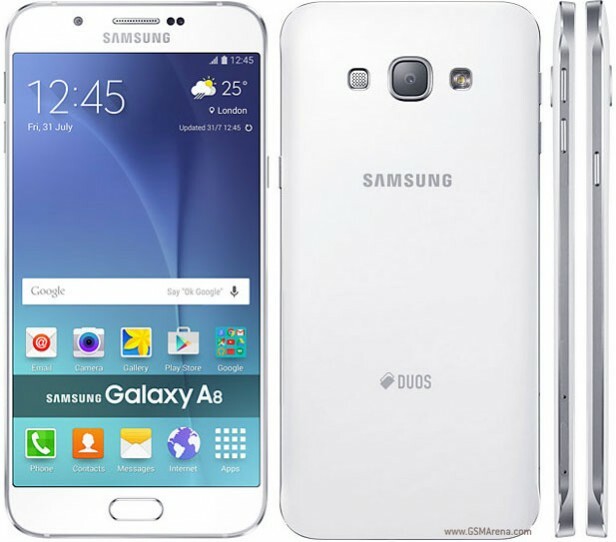 Powered by 1.8GHz processor alongside 2GB RAM and a 16 MP camera, the Samsung Galaxy A8 Duos was announced in July 2015 and was made available for sale starting with August the same year. It features a 5.7 inches captive touchscreen with more than 16 million colors. The resolution of the display is 1080 x 1920(~ 386 ppi pixel density). As great as this phone may sound, it can create a lot of troubles when it gets stuck in various apps or stops responding to commands. Read this guide to learn how to deal with these issues by appealing to a smart procedure called a soft reset. The processor of the smartphone is Quad-core 1.8 GHz Cortex-A53 & quad-core 1.3 GHz Cortex-A53 or a Quad-core 1.8 GHz Cortex-A15 & quad-core 1.3 GHz Cortex-A7- A800Y; Qualcomm MSM8939 Snapdragon 615 or Exynos 5 Octa 5430 – A800Y while the graphic processor is Adreno 405 or Mali-T628 MP6 – A800Y. The phone has internal memory of 32 GB and 2 GB of RAM. The operating system is Android OS, v5.1 (Lollipop). This device is dual sim. As any smartphone, this phone works nice and smooth when you buy it but after a period of time, it starts to crash and freeze when you open some applications. For this reason it is recommended to perform a hard reset to the factory settings of the phone. You might think that this process is difficult and you have to go to a GSM store and pay a fortune for a hard resetting your phone, but you are able to do it by yourself if you follow a few steps. What is important to mention is the fact that, if you decide to perform a hard reset on you Samsung A8 you will lose any personal data on the phone, including your accounts, your passwords, your pictures, your music and your contacts. This is the reason why it is strongly recommended to perform a backup on your phone before you start the hard reset process. There are two known methods to perform a hard reset.